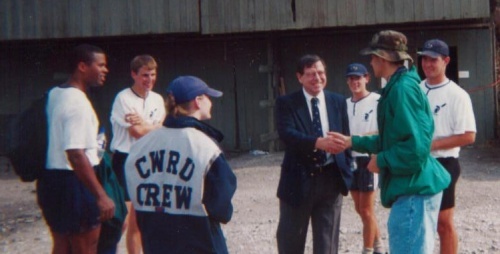 Cleveland held its first annual Head of the Cuyahoga Rowing Regatta. Competing crews came from Dayton, Columbus, Pittsburgh, and Cleveland. Click here to see the winners from each event (pdf) as listed in the the Cleveland Plain Dealer. CWRU President, Agnar Pytte, came down to the regatta to meet the team. His name graces the bow of the team's first-ever shell. In the photo from left to right: John Calhoun, Dan Bachmann, Glynis Lough (back to camera), Agnar Pytte (in the sport coat), Mark Lemkuhle (between the hands), Davian Kaplan (shaking hands), and Brad Krock.